The first time my trainer saw it, she was like, "...WHAT is THAT?" I am so the black sheep sometimes! She loaned the brown one to me recently, and I've been really happy with it. The honeycomb flexes when my weight hits the saddle, but springs back up instantly when my weight comes up, and I can really feel the pad absorbing the concussion. It feels like there are springs inside of it, like a firm mattress. At the front of the pad, the honeycomb is a little stiffer to account for the increased pressure at the front of every saddle. 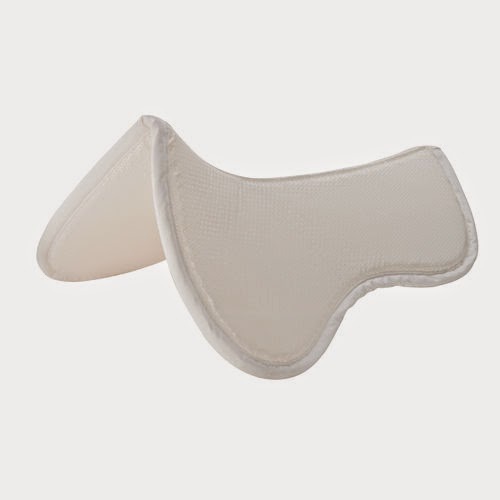 Just to grab it and hold it, it's a crazy feeling, it sort of crinkles under your hand, but not all the way down - there's always some resistance to prevent you from hitting the "bottom" of the pad, which is why it's so good at absorbing concussion. Connor seems to like it - the sweat marks are still indicating good things, there's been no "funny business" on the other side of XC jumps, and he's been happy to work over his back. I switched back and forth to really make it a fair trial between wearing it and not wearing it, and if my trainer saw me without it she'd request that I put it back on - even when it was the ugly brown one. Sorry to use this picture again, JenJ, but it's the only one I have so far of him wearing the Supracor pad. I told my trainer "Look, I got one of my own in a socially acceptable cover!" and she laughed. New, the pad itself goes for $208-214 at Dover, and the cover goes for $114-175, but since they've fallen out of vogue (as half pads seem to do, is there any piece of tack that is more subject to trends than half pads?) I managed to get this one for $90 off of English Tack Trader. They hold their value well and are hard to find used (which is why it took me two years of active searching to get one), so if you want one and see one, snap it up immediately! Any other Supracor fans out there? I'm lucky that our saddles are all custom made/fit to each horse, so a half-pad to improve fit hasn't been a necessity. The Supracor pads do feel really weird, but seem like they would work really well. Glad you found one of your own! Still need eye bleach, btw. I've heard two schools of thought on that. The saddle fitter here that comes up from Florida every October says even a custom saddle needs a little something extra to help absorb concussion, and I've also heard what you say. I don't think there's a right or wrong, if your horse's back is healthy and he's working great, then you're doing it right. Sorry about the eye bleach. I'm going to recreate that picture when he's grey/peach colored after clipping this weekend, just for you. When I was younger I was pretty obsessed with these but never got one. They are definitely neat pads and there are several people at my barn who swear by them (and prefer them to Ogilvy pads!). I already have a half pad collection so I plan to avoid trying one unless it is vet recommended (then I'd have a good excuse). And growing a tree size every 6 months is crazy! I know I'm the voice of dissent, but I am with your barnmates, I do prefer these to Ogilvy's too, and think they're better at shock absorption and heat dissipation. But like I said to Jen above, if it's working for you and your horse is sound, you're doing it right. Yeah that was a wild year. We went from a medium tree Beval, to a MW Stackhouse, to a W Toulouse in just over a year, and each of those had fit before he grew! I almost bought one awhile back to try on the racehorses. I hadn't really heard much about them before, so it's good to hear a positive review. You probably won't since they're not in style, but the Dr. Marks scientifically-researched stamp of approval means a lot to me. If she likes it, I know it's good. Let me know how you like it in the racing application if you ever get one. I haven't tried one of these but I'm not looking for ways to break the bank haha. One half pads more than enough and my Ogilvy does what it needs to for me and Huey. I am with you on the shock absorption thing. Even a well-fitting saddle isn't going to displace shock. I had one for a while that I picked up for $5 at a tack sale. I liked it well enough but not as much as the Thinline I had at the time. They're nice pads though. $5!!!! Send me your magic mojo! It's a really good option for that situation, I think. Let me know how you like it if you get it! Never heard of them...but sound super! Ba dum cha! Super/supra joke? They are great. Oh this is interesting! 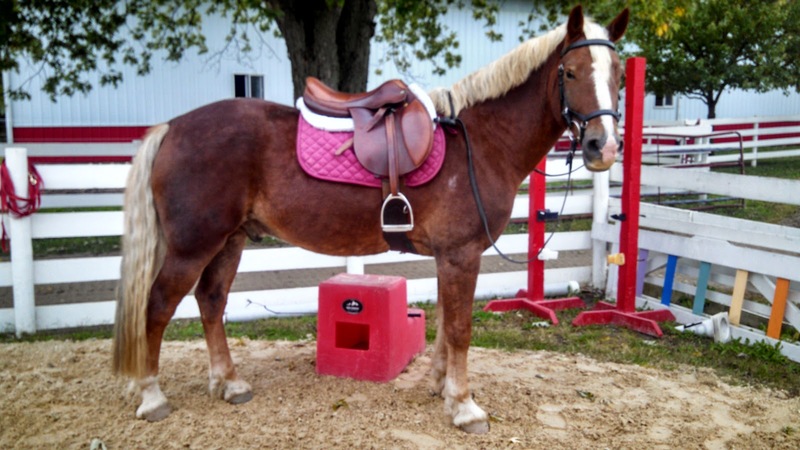 Have you tried an Ogilvy and know how it compares? I am not super happy with my Thinline, but I'm also not quite ready to jump on the Ogilvy trend. To me that is too much like riding on a pillow, but I'd like to help Simon's saddle fit which is not BAD just nqr. I have held an Ogilvy and messed with one, but not ridden in one. I don't care for them because they don't have the structure required to displace concussion effectively, (if you squish one, your hand goes to the bottom of the pad) and being memory foam, they're going to trap heat under the pad. I think Ogilvy rocketed in popularity because they're so customizable, and who doesn't like all the pretty things, right? Haha. I wish I could get Ogilvy covers for my Supracor, but the Supracor is the better pad in my opinion, so I'll take my plain quilted/fleece cover. Well I read this and immediately thought "that sounds better" plus I was planning on making my own custom covers anyway... maybe I'll do some ebay digging and see what I can find. If you do make covers, let me know! I'll buy one/be a guinea pig. Thanks for the review - I'm just using an old foam cashel thing and it's less than ideal. I want shock absorption rather than the cushion-y feel. Supracor sounds like a viable option! Interesting! The Supracor and the EquiFlex Sleeves both come highly recommended by Funder, so the latter is on my to-buy-SOON list and I'm still pondering whether a Supracor might be a good second pad for us. Mostly I'm worried that it'll be thinner than the Woolback and might negatively affect saddle fit as a result. If I can find one endurance-shaped inexpensively, I'm now even more inclined to give one a try. I have never seen a Woolback, but the Supracor is quite thick. withouth the fleece thing, it's I think 3/4" to 1" maybe? It's the pad of choice for enduros for sure, Dr. Marks is the queen of scientifically-based endurance rides. I'm a huge fan of the Thinline pads. I noticed a visible difference in Annie when I added one to her saddle and she protested in a major way when I forgot to put it on one day. Similar thickness to the Supracor so it doesn't add bulk. Yeah, I think it is just a bit thinner than the Supracor. I've heard good things about them too. I'm so sorry for your Annie. I actually have a Supracor insoles in some of my shoes, they're a bit pricey but they feel very nice after a long day standing or walking around. Much much better than your typical insoles. Thanks for this review! I'm on the search for a new half pad as my Thinline should be retired soon. I didn't know they made insoles, I need to look into those! I believe those would be amazing. You're welcome and nice to meet you! Let me know how you like it if you get one. I would definitely give it a shot. I have a lot more faith in the honeycomb material to fill in areas below the saddle than in memory foam. Thanks for posting this review! I've never heard of this brand but it sounds really interesting. I'm not a big trend follower so I haven't really gotten too excited about the ogilvy's (am I the only person too lazy to want to have to retighten my girth after getting on?). I'm with you on the girth retightening, and I'm just not a fan of memory foam as something on a horse's back. Let me know how you like it if you get one!